I've never missed a single copy of The Edge since its owner Tong Kooi Ong confessed to having promised to pay US$2 million to Xavier Andre Justo for information on 1MDB that the French national had allegedly stolen from his former employer, PetroSaudi, and the subsequent 3-month ban imposed by the Home Ministry was reversed by the Court. 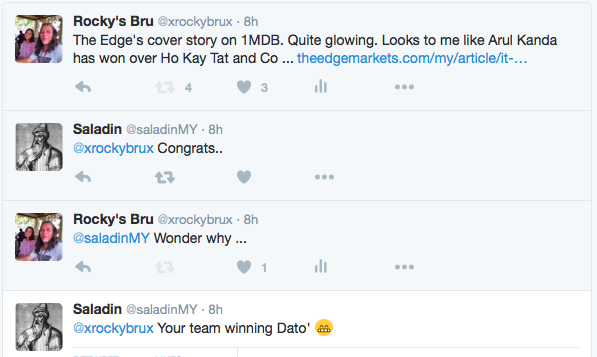 I guess I was curious to see how Tong and his editors would be treating stories related to 1MDB afterwards, after the bizarre US$2 million confession, especially. For months before the confession and the ban, The Edge, along with the rabidly anti-1MDB London-based portal Sarawak Report, had been pounding hard on the 1MDB and Arul Kanda like there was no tomorrow, so hard that it would be unfair to blame anyone for suspecting that Tong might have a vendetta against 1MDB, its chief Arul Kanda, its Advisor the PM, or all three! The weekly's latest edition is a treat for the curious like me: it features Arul Kanda and 1MDB on their cover* and 6 full pages of stories inside! Check out the cover. 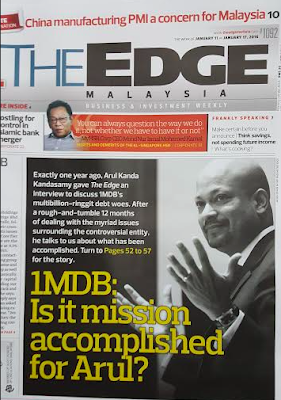 The Edge asks itself a question about 1MDB: Is it mission accomplished for Arul? 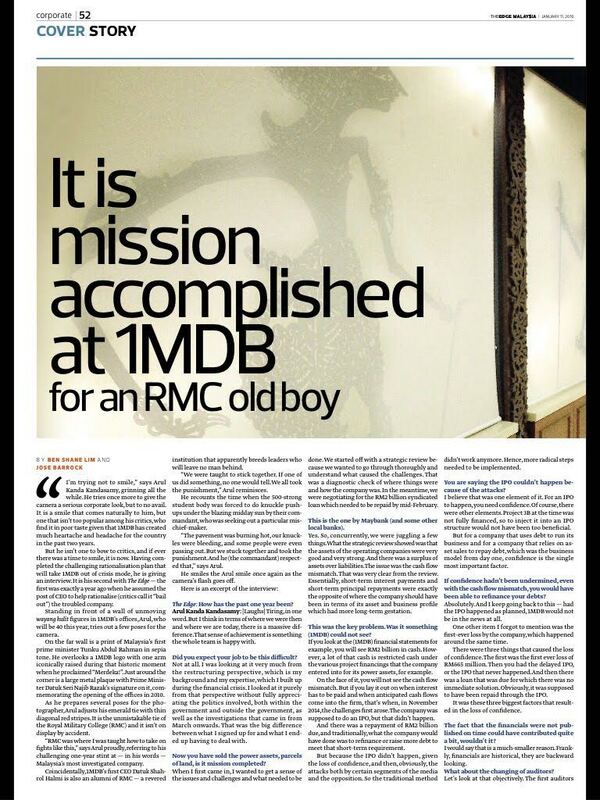 On page 52, the Edge answers its own question: It is mission accomplished at 1MDB for an old RMC old boy. That all-important question mark has been dropped! But does that mean Arul has won them over? It seems that way to me. The whole report on Arul and 1MDB was glowing, if you ask me. Others may not think so and accuse me of reading too much between the lines. I initiated a discussion on Twitter last night to gauge what others think of it. If this was the 20th century, I'd be inclined to believe it! p.s. I've decided to include some excerpts of the interview with Arul Kana below but if you can, Dear Readers, beg. steal or borrow a copy of The Edge's latest and read all about it with an open mind. To be fair to the two writers, it is an excellent Q & A! THE EDGE: Let's just go back, before we dwell on the restructuring. With 20/20 hindsight, would you say that 1MDB took on too much risk at an early stage? Was this the right business model? To me, the use of debt is not wrong. In your day­to-day life, when you buy a house, it is debt funded. When you buy a car, very similar. Debt creates a certain discipline that you have to repay the debt and, therefore, run your business in a particular way. The use of debt in a government-owned company also frees up funds that would otherwise have to be injected as equity. It can be used for development projects and so on and so forth. it becomes a concern is where the maturity of the debt and the cash flow of the company don't match. Even in that scenario, many development companies will tend to refinance debt so you don't necessarily anticipate until the project is finished. And if you look at 1MDB, that is what happened. If you look through the financial statements over time, debts were taken, they were repaid, new debts were taken on, as the company grew and the business profile increased. But clearly you need confidence to do this. And this confidence comes in many ways. For, example, you doing what you said you would do. Achieving a plan as envisaged. It has to do with market environments in general. It has got to do with achieving certain criteria and guidelines. When that doesn't happen, and you can debate the reasons for that, then you have these problems. I am not trying to simplify the issue. Rather, what I am saying, the model to me is fine. What caused the cash flow mismatch was the inability to hit the target which was the IPO. THE EDGE: There is this perception that the only thing 1MDB has done is strip the assets and sell them to foreigners and we are left with nothing. I think that is completely unfair. The asset acquisition went in tandem with the debt acquisition. For example, if you buy a house RM100,000 house with a RM90,000 loan. You then buy a second, third, fourth and fifth house. You now have RM5000,000 of houses and RM450,000 of debt. Let's say you cannot rent out those houses, and you cannot pay the mortgage. You either get a new infusion of cash to pay the mortgage or reduce the loans or you have to sell the houses. That is where 1MDB is today. 1MDB took on debts to buy assets. Now some of those debts have become due. And we are in a position where it is difficult for the shareholder to add additional equity. Therefore, the only option is to dispose of those assets in order to reduce debt. You can't have your cake and eat it. You can't say, 'solve the 1MDB problem', and at the same time, 'you can't sell assets'. THE EDGE: One point that people are not comfortable with – the asset sales may have helped bring down the debt but what we have in return is foreign ownership of certain prime assets. Certain parties think power assets should be owned by locals, for example. As for the two prime pieces of land, they have a lot of future value and it would be better if they were owned by the government. Some would also say if 1MDB was not financially distressed, it would not have to hold a fire sale to foreigners. What is your opinion on that? Let me address your last point first. There was no fire sale. We have got full if not higher value for our assets than what the market anticipated. The land sales in TRX are proof of that ,we set new benchmarks. For Edra, we sold it at almost full value, in terms of equity value on our books. Same thing for Bandar Malaysia, I don't think anyone believed me when I said RM11 billion to RM12 billion, but we did it for RM12.35 billion in terms of land value. In terms of Edra, it was never our asset to start with. It belonged to the private sector. Anyway, foreigners are allowed to own up to 49% of power. If you look at the fuel supply, it is only from TNB and Petronas, so we have control. If you look at transmission and distribution, it is 100% controlled by TNB. PPAs are also 100%-controlled by TNB. As for generation, it has been allowed to be done by the private sector. We also have a very strict regulatory regime overseen by KETTHA and the Energy Commission. If you look at countries with a very similar regime, like Singapore, they allow 100% foreign ownership. In fact 80% of Singapore's power plants are owned by foreigners. In fact, the largest is owned by a Malaysian company – YTL. If you look at the UK and Australia, they allow 100% foreign ownership. So foreign ownership in itself is acceptable if you control the input and output and there is a good regulatory regime. A lot of people don't know this,vbut under the PPAs, TNB has step-in rights if the power plant operator does not perform. We are protected in so many ways. Factually and analytically, there is no issue with foreign entities owning the power plants. In terms of Bandar Malaysia, we own 40%. Iskandar Waterfront Holdings owns 60% of the consortium. In turn, Kumpulan Prasarana Rakyat Johor owns 40% and Credence Resources con­ trols 60% of IWH. CREC only controls 40% of the consortium, which is an effective stake of 24%. Between KPRJ and 1MDB, the federal and state governments control 54%. When you look at any other assets in the country, that ownership is very small.And it represents FDI (foreign direct investment).And FDI is important to us. On the one hand, we need FDI and the opposition complains when there is insufficient FDI. On the other hand, when FDI comes in a controlled manner, when they are paying top dollar through a tender process, why is there any cause to complain? How do you make money from land? You sell it. THE EDGE: After selling off the assets, do you think confidence is back? There are still a lot of naysayers out there. I think those are two different topics, to be honest. If you look at the naysayers, if you compare where they started with –in January, February and March – I think today you will see a big difference. Where we started off was (allegations of) corruption, criminal breach of trust, etc. And whilst I do not want to prejudice ongoing investigations, the view I have always had is that this is just a business issue. I think now, most of the critics of the company, they are not criticising the basis of the company or how things were done, as opposed to criminal allegations. That is an important point that I would like to clarify. What I would have liked is to have a time­frame to stabilise the company, in order to maximise value for the shareholder. Again, if you look back at the global financial crisis, the immediate thing that the government did was to step in and provide funding in order to stabilise the company and then have an orderly resolution process or the disposal of the assets, either through the government or the private sector. If you look at all the enquiries and the investigations, they were conducted after stabilisation had been achieved. In 1MDB,we had a very different challenge. Investigations started first, and very early on, which significantly affected our ability to maximise value from the resolution process . You will notice a significant difference be tween the strategic review and the rationalisation plan, which was announced in June. If you look back at those two announcements, you will see a clear shift. In February, we wanted to continue running the business of the company,albeit in a more independent fashion. Like what we did with Edra, we wanted to do with TRX and Bandar Malaysia . But subsequent to that, the Sarawak Report articles came out. The Edge articles came out every week. The Government then ordered the Auditor-General to look into 1MDB and report to the PAC. The subsequent investigations commenced, and frankly that left us with very few options. The best thing would have been for the government to inject capital and stabilise the company. But given the political considerations at the time, it was not possible. The preference was for the company to resolve its own problems. With a RM950 million loan from the Government, we had to make do. So we had to embark on a disposal process. We signed a joint venture with Land Lease in March. 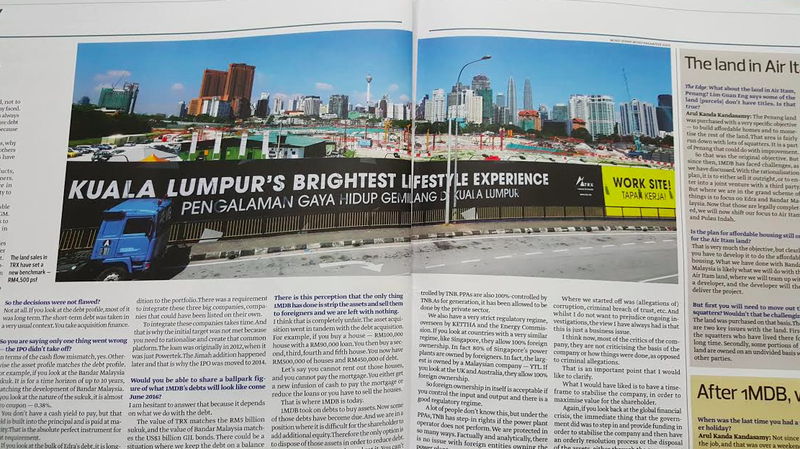 We sold major plots of land in TRX, subsequently we had to announce the sale of Bandar Malaysia and Edra. WHY IS THE PM CHAIRMAN OF THE ADVISORY BOARD? 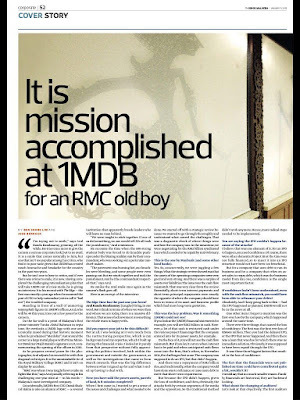 THE EDGE: Why is the prime minister the chairman of lMDB's advisory board? What happened initially was that TIA (Terengganu Investment Authority) was owned by MB Inc Terengganu. At that time, there was a board of advisors. The federal government then agreed to guarantee the sukuk. The original RM5 billion sukuk was for TIA when it was owned by MB Inc Trengganu. At that time, Tengku Mizan, the Agong (and Sultan of Trengganu), was the chairman of the board of advisors. But when the federal government took over, that was when Article 117 got inserted (into 1MDB's Articles of Memorandum) – that the federal government has the right to determine certain things that impact the guarantee. And in order to do that, you need someone on the same level as Tengku Mizan. Who else but the prime minister? That's how it started. When the federal government took over, that structure was there and it was not changed. But from a company law perspective, the chairman of the board of advisors has zero impact on the company. We have never obtained any permission under 117.We have only always followed the normal Companies Act procedure. We have never invoked 117 for any procedure. The issue arose when MoF Inc also appointed the prime minister as the Finance Minister shareholder representative. That is where the confusion arose. Under normal company law, board resolutions need shareholder approval. And he signed as the shareholder representative. And that was then spun, when in fact, the chairman of the board of advisors has no legal say. This cannot be Arul Kanda, it must be his evil twin Auta Kanda. On March 11th, the Minister of Finance (PM Najib Razak) had issued a Parliamentary reply, confirming that the remaining US$1.103 billion had already been “redeemed” from Brazen Sky’s alleged off shore fund in the Cayman Islands and stating that it was now being “kept in US currency” at BSI Bank, Singapore. And citing BNM regulations for the need to keep it in Singapore! 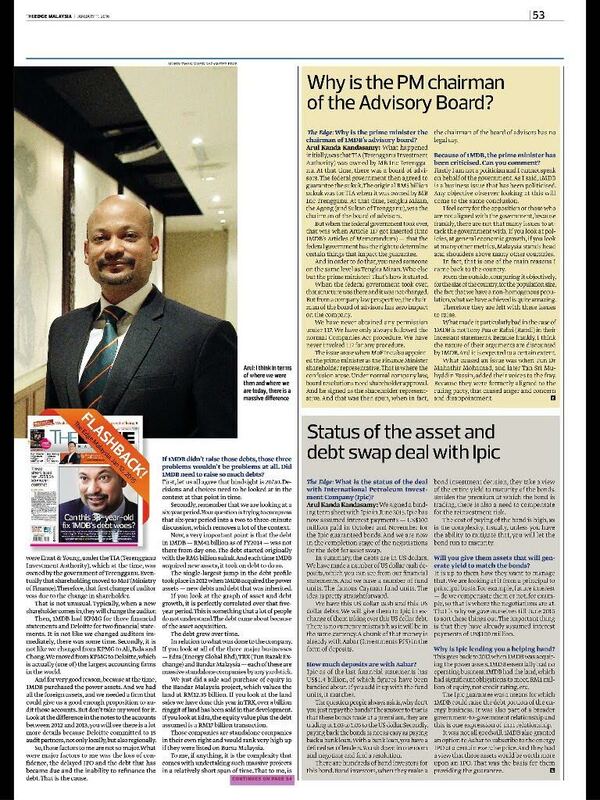 Arul was the one who could not decide whether BSI was in cash, units or thosai, and yet, in the BOD minutes: “Mr. Arul said that, in compliance with the covenants of the US$975 million loan from the Deutsche Bank (‘DB’), the redemption proceeds had been pledged to DB until repayment of the loan”. There you have it, the (non-existent) US$1.103 billion cash was supposed to guarantee another loan by Deutsche Bank. Hence Auta Kanda lied to the Board AFTER HE CLAIMED PUBLICLY THAT THE MONEY WAS MERE UNITS. So Jibby & Auta are unable to tell whether billions in public cash are in US currency (hence the promise to "redeem the money") and why in the end it's NEVER been redeemed; it never existed. And is now under investigation in Singapore. Obviously the hard questions have not been answered. The 90:10 analogy for buying a house is totally misleading. 1MDB had a capital of RM 1 million and borrowed against government guarantees or letters of support for RM 50 billion. You know what ratio that is ? 50,000 to 1 ! So what did you do with the RM 50 billion of debt ? Buy Edra for RM 12 billion. 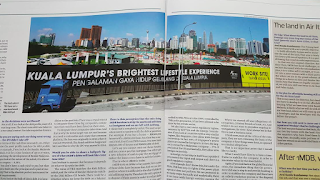 Buy Bandar Malaysia land very cheaply. Altogether cannot reach the use of RM 50 billion. Where did the rest of the money go to ? We are not questioning the asset side of your balance sheet, but the liability side. Where and to whom did the billions go to ? So Arul, you enter into an agreement to buy a house for RM 100,000 with a capital of RM 2 because your grandfather provided a personal guarantee for the loan of RM 99,998 but the vendor only gets 50,000. Where did the balance of RM 50,000 go to ? No point telling me after 5 years that the real value of the house has gone up to RM 100,000. I still want to know what you did with the balance of money that you raised earlier. What do you expect from a paper which is under threat for another round of suspension? They also want to cari makan under this dictatorial regime maaah.. 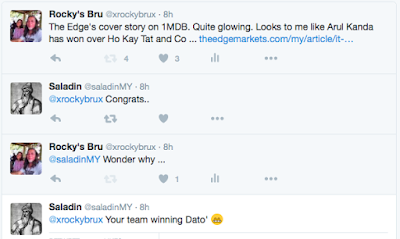 Rocky...I doubt it that Arul won them over. Rather I think the Edge knows it is "Game Over" and there is little point of attacking 1MDB as they have used up all their ammos and weapons and missed the all important "window of opportunity". So they know when the AG's report is submitted and MACC investigation is completed and PAC has finished their inquiry, 1MDB will be absolved. So they are preparing to that by making amends to their earlier attacks I guess. I think Najib should show no mercy to all the shenanigans who plotted the conspiracy to sabotage Najib and Malaysia. when he said about buying house people need to do debt, and motorcars etc, i dont know what he is thinking. all i can say is, he was trying to normalise the word debt and he was saying it is okay to have debt. i can only assuming that. so if i am correct on that, this means arul kanda is an oxymoron. i dont want debt. rocky doesnt want debt. even ask arul kanda, he doesnt want debt. but he may say he wants debt. because he is an oxymoron. all those housing debt, motoring debt, study debt, they are debt of necessity. if i can buy a honda accord without debt, i want to buy it without debt. of course that is not possible. dont tell me about saving. i just want to stress here that, those debts are necessary. and housing debt. for a 900k The Nest condominium, yes u need debt to own that. there is no ordinary people having a weekly pay of 900k RM to go and buy it without debt. but if The Nest - 900k unit - is available for..lets say 100RM, then debt is no need. i can buy 1000 unit now. let alone one. so arul, those are necessary debt. and the only people having to shoulder the risk is ME. one people. me. 1MDB debts, are they of necessity? my bet is Arul will say it is necessary. because he got his own reasons. and only him can verify the reasons to be valid or otherwise. 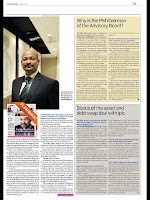 and arul, when 1MDB do debt, who is going to shoulder the risk? yes. u are right. it isnt you. its the public. i hope thats enough for now. ps - arul, the land were sold to you and cost the government in the region of 10-20 billion. and you got the face to brag about it? jesus christ. arul stop talking. It's so funny that Moody's downgraded us today when you just wrote an article "blessing for Malaysia" just a couple of days before. Goes to show Najib is crap.
" For example, if you buy a house RM100,000 house with a RM90,000 loan. You then buy a second, third, fourth and fifth house. You now have RM5000,000 of houses and RM450,000 of debt." Arul kanda, why are you so stupid getting a loan to buy up to 5 house if you dont have the means, resource or the ability to finance the house on the first place?